Nothing speaks LOUDER of Christmas Spirit than small communities pulling together and making Christmas happen for others. As promised in my Small Town Christmas Article I am going to share with you what cool and amazing things small towns around us are doing for Christmas. 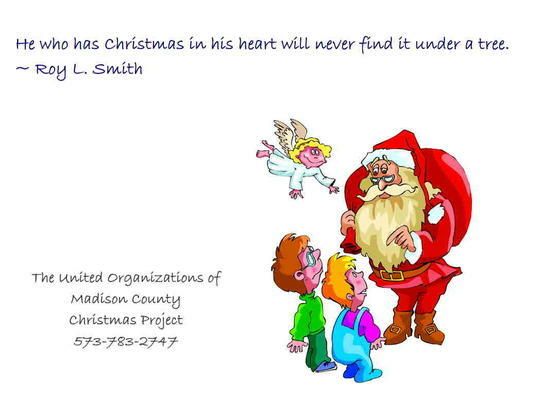 The United Organizations of Madison County, Missouri are pulling together to help create Christmas for families across Madison County Missouri. We all know how exciting Christmas is, but for some Christmas can also bring on a bit of heartache...well these folks are working together to help take that heartache away and fill others with the Christmas Spirit. I love traveling around Missouri and reading about towns in the Show Me State. Oh, and thanks for visiting my blog.